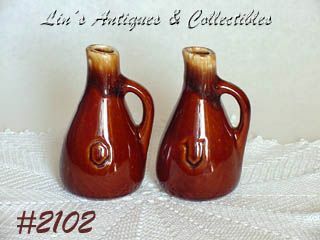 This listing has a very pretty unmarked McCoy vinegar and oil cruet set from the brown drip dinnerware line! Set is in the warm brown color with pretty drip hat is more light tan than white. They have a shiny over-glaze. Set is in excellent condition -- no chips, no dings, no cracks, no crazing!